Place the cream in a heavy pot and add the two vanilla beans, split down the middle and seeds scraped out into the cream. Bring this to a boil and shut off the heat and let this steep for some 15 minutes or so. Meanwhile, separate 10-11 (I find the latter more likely as local organic eggs here can be quite small) organic eggs and set aside the whites for another use, as you only need the gloriously deep orange or yellow yolks in this recipe. In a bowl, whisk the egg yolks with about 1/3 cup granulated white sugar until the sugar is dissolved. Some folks add more sugar, but I like to savor the richness of the cream and the taste and aroma of the vanilla beans, without too much sugar to interfere with the experience. Strain the milk mixture. Add about 1/2 cup of the warm milk to the egg yolks and whisk, then add this egg yolk mixture back into the warm milk and whisk to incorporate. Be careful, if your milk is too hot you will end up with scrambled eggs in cream… Next pour this mixture into individual serving ramekins or pottery vessels that are then placed in a roasting pan with hot water going up halfway up the ramekins. In other words, the ramekins are in a hot water bath. Put this all into a 325 degree F oven for roughly 30 minutes until the custards are just set, do not overcook, and remove from the oven and the hot water bath and allow them to cool. After an hour or two, stick them in the refrigerator where they must get their beauty sleep for at least 3-4 hours before you are ready to serve them. I often make these a DAY ahead, so the night of the party I am confident my stunning desserts are ready to go. Minutes before serving them, take them out of the fridge, dab the surface with a paper towel if any moisture has gathered, and add a GENEROUS layer of white sugar (I use homemade vanilla sugar) all over the surface of each dessert. Turn on your blowtorch and singe the sugar until it caramelizes but doesn’t burn (this takes some practice) then let it sit for a minute or two so that the melted sugar turns into a solid hard piece of candy that will CRACK gloriously when you eat it. If you have cool friends over for dinner, they can blowtorch their own desserts, but please do not encourage this if they have had too much to drink, as burning guests are not good for your reputation as a host or hostess… Hahaha. :) These creme brulee were brilliant. Incredibly rich and creamy, and redolent with vanilla flavor and specks of the bean, without being too sweet. The caramelized top was just the perfect foil for the cold creamy interior. A real home run. You should try it one day. Oh, and about 1/5th the cost of ordering it at a fancy restaurant. And one final piece of marketman advice… use SHALLOW ramekins or only fill them halfway (I didn’t follow my own advice in these photos) so that the proportion of sugar topping to cream is higher… YUM! And, if you want a deeper vanilla flavor and a more velvety texture, allow the cream/vanilla/sugar mixture to “cure” in the chiller overnight after before pouring into ramequins and baking in a baine marie. Delicious…love to try this…I don’t have a blowtorch. Wonder why I never got one…I can use that for ham too right…? Hmm…. I added some ginger on mine…. and some valhorna white chocolates.. 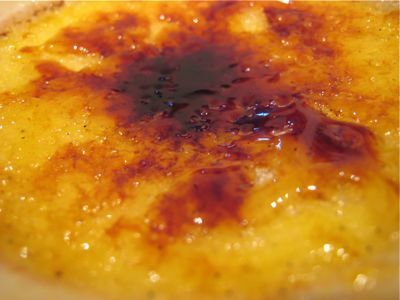 I make crÃ¨me brÃ»lÃ©e quite often… At least every Christmas, Thanksgiving, and immediate family’s birthday (if celebrated at home instead of at a restaurant). 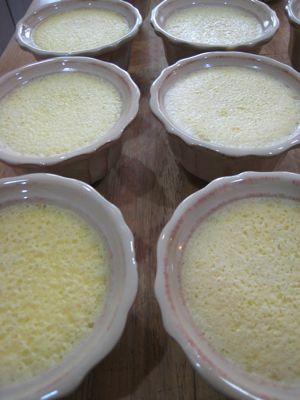 Typically I make “standard” vanilla crÃ¨me brÃ»lÃ©e and then also have some pumpkin or chocolate pots de crÃ¨me for variety. I agree it’s quite easy. I use some recipe I got from the Food Network, probably Ina Garten’s. It took a while to get the caramelization just right, without buring the sugar. What I’ve found is that using super-fine (but not powdered) sugar does the trick for me. Itâ€™s very versatile – it can be flavored with citrus zest, star anise, cinnamon or the ubiquitous vanilla beans if my resources are kind of full or the generic vanilla essence or extract if Iâ€™m kind off at the end of the rope. One thing I find very helpful so nothing sticking at the ramekin brush them with softened butter and dust them with sugar and invert the ramekin before pouring in your egg/cream mixture. When you spoon in it all comes together. I 2nd the suggestion of ted regarding getting the industrial blowtorch vis-a-vis the tiny one sold at gourmet stores. It not only cost half the price but will also take half the time to caramelize the sugar. It is also what is use in commercial kitchens. I love the cardamom creme brulee from People’s Palace. What a wonderful creation. Thanks everyone for the tips and recipe. Will try this soon. MM, the local vanilla beans are grown in Bukidnon. OH, WOW, I LOVE THIS DESSERT! i’ve always thought of creme brulee as little more than fancy upside down leche flan. and i like them both! chris, fried neurons, ted, artisan, THANKS for those tips… I was wondering how the restaurants got such a nice even crisp top… okay, I will have to use blitzed or superfine sugar, mist it with water and get one of those momma blowtorches… heehee. I think the last one will have to wait until I am certain of my source, I have visions of welding my ramekins together by mistake! Oh, I also like the nightime sleep in the fridge to get really vanilla-y. Love creme brulee. Have never made it. I did make a panacotta once. That came out pretty good. The leche flan has been a one hit wonder for me. Came out great the first time. The second and third attempts were disastrous. ah, my favorite part is “knocking” on that caramelized sugar before cracking it then digging in to the yummy creaminess inside (cholesterol levels be damned during that blissful moment!). mmm, that first picture had me salivating, MM! 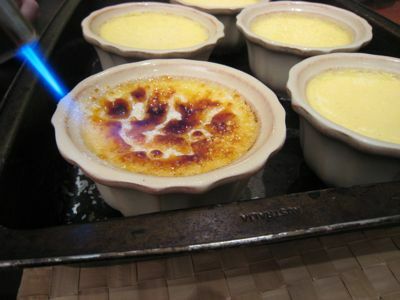 am drooling for creme brulee. where can we buy the vanilla beans here in metro manila? haven’t seen them in the local supemarkets here yet. miles, actually, they grow them in davao, though I understand recent weather conditions wiped out the crops. You can find them at Santis, cook’s exchange, rustan’s when there is supply. Also Flavors n Spices in market!market! I’m happy about the “misting the sugar” tip I got here tonight – will try it next time – thanks! hmm leche flan pa lang ang nagagawa ko. call me crazy but for non – fancy dinners, i like to leave the torch on the table along with some extra sugar, so i can have the sugar with just a bit of the custard-y stuff then put more sugar then torch it again! I skim it, sort of the way the taho vendor does, to get a thin top layer then let the magic happen again! Creme brulee, pannacotta, leche flan…these are a few of my favorite things. Ei chrisb, is the egg yolk already incorporated in the cream/vanilla/sugar mixture before curing it in the chiller overnight? Thanks. Can you please suggest the exact brand of heavy cream that you used? :) Thanks! Am making this recipe tomorrow…..
Great dessert! One of my absolute faves – the industrial blowtorches work better than the fancy small ones. One version I do is add chopped toblerone to the cream while heating. Heaven! Now I will have a chance to use that blowtorch bought years ago! Although come to think of it, there are no decent cream available in this parts as MM suggested not bothering to make it without it. Tsk,tsk……. Enteng, yup egg yolks already mixed in. The chef instructor didn’t really explain what it does but I noticed the mixture becomes so much creamier after spending the night in the ref- better body, mouth feel and flavor. Works when making vanilla ice cream as well: chill overnight before churning the custard in the ice cream machine. Thanks Ted and artisan for the tips re commercial blowtorch. To think we had so many blowtorches before for our business. Hahaha…never thought we could use that. Doesn’t poison ha? Let me look then. 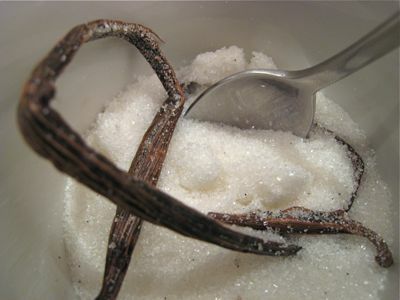 don’t forget…you can reuse the vanilla pod to flavor sugar, pat them dry and stick them in your sugar canister…the flavor and the smell of the vanilla penetrates the sugar…and you’ve got yourself instant vanilla sugar! That last picture is the one that can convince me to go out and buy a blowtorch! I’m just really concerned about using gas to light a fire and cook my food directly. I always thought that it was bad for the body or something, not to mention that my food would taste of fuel. Mmmmmm, YUM! Just perfect for the upcoming Thanksgiving or Christmas. Maybe we’ll have that together with the Tiramisu that I’m making. It’ll be one “rich” Thanksgiving Day. Thanks and more power, MM! You rock! Thanks for the recipe MM and the tips from everyone are really helpful for first timers like me. Not so much a fan of cream-based desserts but the pictures sure changed my mind, of course not to mention the idea of torching something…flame on!! !hehe But I wonder what brand of creme locally available can be considered as good and heavy? Another tip for first timers who would like to do this….try using the double boiler method when heating your cream…you want to just maybe let the cream reach the scalding point.like when you see little bubbles forming on the SIDES of your bowl ..take it off the heat source and add some hot liquid into yolks while stirring it continously and return to the bowl …over double boiler again and stir and cook until it COATS BACK OF SPOON ONLY!!!!. This stage ensures your custard to be really creamy…cool and refrigerate until set…when we have to do a lot of these as a dessert for a party of say 100…we don’t have time to bake this further in the oven…this method of cooking the custard like creme anglaise produces the same texture as the baked one. The advantage of using a kitchen blowtorch instead of an industrial one is that the flame is smaller, so it’s easier to direct the bulk of the heat. 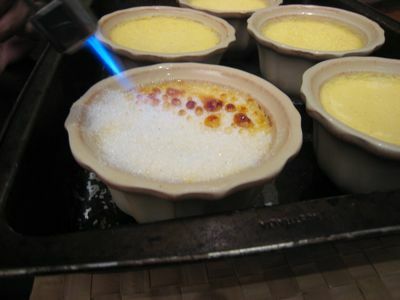 Once the sugar starts melting and bubbling, lift the ramekin up and start twirling the molten sugar around with your right hand, while holding the blowtorch flame stationary with your left hand. It makes for a very even coating and avoids burn spots. Don’t use too much sugar, or too little. Thanks for the tip Betty Q, just sent two BB boxes to Manila for Christmas, will look for large quantity of vanilla beans for next time. Does anyone working in a bakery have any tips on a good pie press? I’d like to buy one, I’m tired of rolling out dozens of pie crusts around Thanksgiving! Would there be a difference if you used brown sugar instead of white for the caramel topping? You’re welcome SISTER!!! IT’s really worth buying those vanilla beans….100 to 120 VANILLA BEANS to a POUND!!!!!!! For pie press….I used to work in a dessert restaurant here in Vancouver where we made those tall old fashioned cakes and mega pies…when we first started, I rolled out each pie crust (I have built my deltoids reallly well back then)…and then Nadine went hi-tech and bought a SHEETER. ….made the life of whoever made the pies a breeze!! !…works like a charm…would the sheeter work for you? MM and K…just like a few other comments I’ve made before…I FORGOT to tell you this one, too….we don’t use granulated white sugar at the restaurant (not the dessert one I’ve mentioned above! 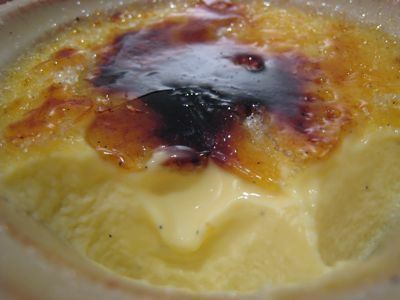 )…another high volume restaurant I used to work at…we used BROWN SUGAR making sure we cover the entire custard with it…not a speck of custard poking through!…and then torch away!…the customers prefer this ….the taste of the topping is different! Hmmm…maybe a muscovado brown sugar would be something nice to experiment on this recipe based on the comments from betty q.
Hi there, I just got to your blog site by chance, googling Farmer’s Market, because my grandson wanted to know where he can buy flowers before 6am. I said he could try Farmer’s Market. I saw your creme brulee that I had been wanting to try, but did not have all the ingredients yet. Where do you buy the vanilla beans and the kitchen blow torch and the heavy cream? Could you give me an idea of the prices? marketman, may i ask where did you buy these ramekins? at how much?